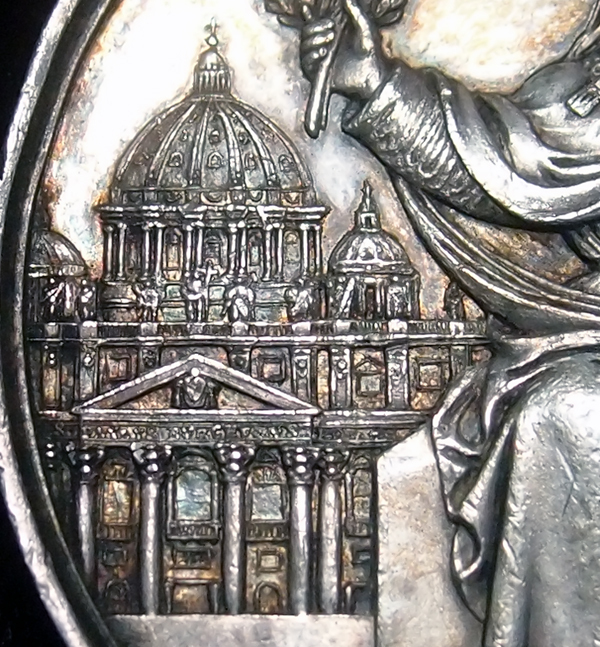 This silver Papal State medal was minted under Pope Pius IX by the prolific Bonfiglio Zaccagnini in 1862 for the canonization of Michael de Sanctis and the 26 martyrs of Nagasaki Japan. 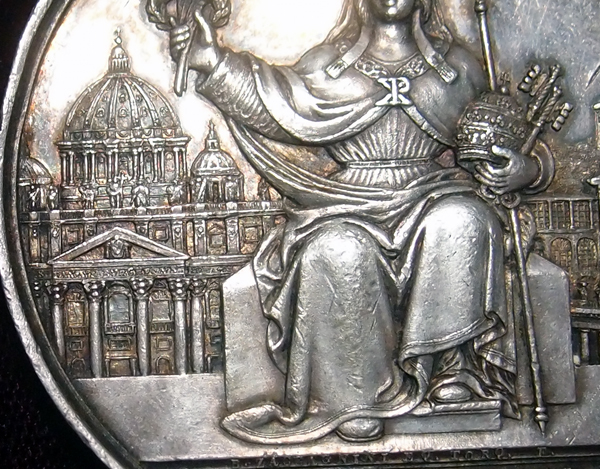 Depicted on the obverse of the medal is a female allegory, sitting with a pigeon above with wings spread. In her right hand she holds two palm leaves inside a laurel ring, In her left arm she holds a crown, a key, and a staff cross. in the background is an intricate detailed depiction of buildings in the city of Rome. 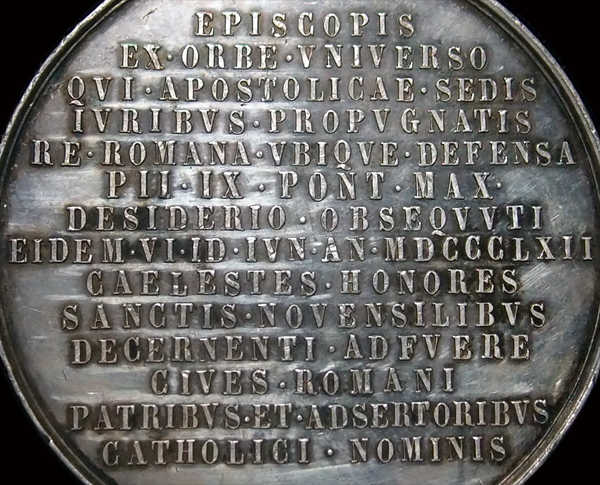 On the reverse is a 14 line Latin inscription announcing the Canonization of the the Martyrs of Japan and Michael de Sanctis. The citizens of Rome (render homage to) the bishops from all over the world, fathers and protectors of the Catholic name, who, after defending the rights of the papacy and everywhere acting as advocates of Roman Catholic affairs, heeded the summons of Pope Pius IX and, on June 8, 1862, attended his conferment of heavenly honors upon the newly-elevated saints. Twenty-six Martyrs of Japan: Christianity was brought to Japan in 1549 by Francisco Xavier, Cosme de Torres and Father John Fernandez. With hopes of beneficial trade relations with Europe through Spain and Portugal the ruling parties in feudal Imperial Japan reluctantly agreed to allow Jesuits and later Franciscans to build missions. In less than 50 years there were hundreds of thousands of Christians in Japan. By the end of the century there was a growing mistrust of the west, the church and its intrigue, and the growing ranks of japanese converts. The religion spread fast and its new converts took to it zealously. The religion was eventually suppressed for periods of time and at varying degrees. Considered among the first of what would become a growing number of persecutions was the execution of six monks and 20 converts (some as young as 12 years old) in 1597 at Nagasaki. Missions and homes were destroyed and the Christians were crucified after a local ruler ordered a list of all Christians to be made and set out purge that population. They are said to have been joyous at their death and exhibited brave resolve in their faith meeting the end without fear. Cloth from their garments were gathered and it was said that they worked miracles. For their sacrifice they were canonized by Pope Pius IX in 1862. Michael de Sanctis: Born September 29, 1591 at Vich, Spanish Catalonia, Michael decided very early in life to be a monk taking his vows at the age of 15. He later joined the Discalced Trinitarians eventually serving as superior at the Valladolid monastery. He devoted his life to prayer, to the holy trinity, the Eucharist and he is said to have been rapt in ecstasy several times during Consecration. He died on April 10, 1625 and he is held up as an example of a saint in life, absolutely devoted to god. He was beatified by Pope Pius VI on May 24, 1779 and Canonized June 8, 1862 by Pope Pius IX.